Cash in on this $3 Trillion "Mobile Revolution"
If you can stay ahead of the curve, you can put yourself in position to earn life-changing wealth. And meanwhile, even just a $100 stake in Amazon during the dot-com boom would have turned into more than $1.5 million. And if you act now, it might help you add seven figures to your net worth. 5G is the next generation of wireless communication. Simply put, it will provide speeds that are 100x faster than the 4G standard in use today. You see, not only will 5G support powerful new applications for our smartphones, but it will also be the backbone for a new $3 trillion market. And the key to creating literally trillions of dollars in sales, market value, and wealth for Internet businesses like Google, Facebook, and Amazon. But the growth of the next phase of the Internet — what many are calling The Internet of Things — will be powered by ultra-fast 5G wireless technology. But the “next Internet” — the Internet of Things, or “IoT” — will connect billions of physical devices to one another. Cars, thermostats, even robots in factories — they’ll all be able to communicate with each other effortlessly and share their data. Market research company Gartner estimates that more than 20 billion IoT devices will be installed by 2020, and that IoT spending will soon reach nearly $3 trillion. But for these devices to reach their potential, we need to supply them with wireless networks that can transmit tremendous amounts of data in near real-time. For example, for self-driving cars to become truly autonomous (and truly safe), they’ll need the ability to communicate with each other with near-instant communication. That’s what will enable them to prevent fatal accidents. The current wireless standard, 4G, isn’t up to the task. Simply put, it’s too slow. But with 5G being up to 100x faster, it’s a whole new world. Then I’ll introduce you to other industries that will be impacted by this technology. Automotive ­— For years, Tesla, Google, and many others have been trying to build a viable self-driving car. Current solutions use onboard computers and radar to “read” the environment on the road, and use that data to determine what a car’s next move should be. But with 5G, rather than a single car determining how to move on its own, a highway full of cars could communicate with each other ­to move together as a system. In other words, instead of each car “fending for itself,” every car on the road can coordinate with all the others to help improve traffic conditions and avoid accidents. Given the fact that car accidents are one of the leading causes of death, 5G could help save millions of lives every year. Healthcare — We already use “wearable devices” like the Fitbit to track everything from our sleep patterns to our blood glucose levels. But with the advent of 5G, such devices could be implanted directly into our bodies. Microscopic sensors, for example, could monitor our health condition in real-time — and if a problem is detected, help could be dispatched automatically. Manufacturing — Another industry that will be transformed by 5G is industrial manufacturing. For example, the electronics company Ericsson is testing a way to fix manufacturing problems by using 5G-enabled video in conjunction with Augmented Reality. To show you what I mean, here’s a picture of an Ericsson technician repairing a circuit board by using an Augmented Reality “overlay.” With 4G technologies, displaying such a rich interface in real-time simply wouldn’t be possible. 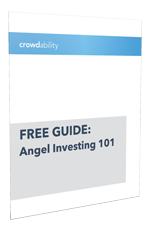 If you’re a long-time Crowdability reader, you already know that timing is everything. After all, as an investor, if you’re too early, or too late, you’ll miss the profit party. But with 5G, we believe the time to invest is right now. You see, we monitor a number of “under the radar” indicators to help time our investment decisions. One such indicator involves tracking the R&D investments of large corporations. 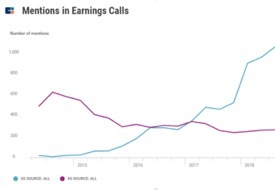 To help track this indicator, we monitor how often “5G” is mentioned during the earnings calls of major corporations. And according to CB Insights’ Earnings Transcript tool, in Q3 of 2018, “5G” was mentioned over 1,000 times in the earnings calls of major corporations like Nokia, Qualcomm, and Ericsson. That’s up more than 100% from Q4 of 2017. And we plan to do everything we can to profit from it. Have You Already Jumped In? Are you already up to speed on 5G and its potential impact? Have you already started making investments in this space? Unsubscribe at any time with a single click. No thanks, I’d like to continue making next to nothing in the stock market.